Citation Information: J Clin Invest. 1999;103(6):799-805. https://doi.org/10.1172/JCI6017. The endothelial nitric oxide synthase (eNOS) gene is induced by a variety of extracellular signals under both in vitro and in vivo conditions. To gain insight into the mechanisms underlying environmental regulation of eNos expression, transgenic mice were generated with the 1,600-bp 5′ flanking region of the human eNos promoter coupled to the coding region of the LacZ gene. In multiple independent lines of mice, transgene expression was detected within the endothelium of the brain, heart, skeletal muscle, and aorta. β-galactosidase activity was consistently absent in the vascular beds of the liver, kidney, and spleen. In stable transfection assays of murine endothelial progenitor cells, the 1,600-bp promoter region was selectively induced by conditioned media from cardiac myocytes, skeletal myocytes, and brain astrocytes. Cardiac myocyte–mediated induction was partly abrogated by neutralizing anti–platelet-derived growth factor (PDGF) antibodies. In addition, promoter activity was upregulated by PDGF-AB. Analysis of promoter deletions revealed that a PDGF response element lies between –744 and –1,600 relative to the start site of transcription, whereas a PDGF-independent cardiac myocyte response element is present within the first 166 bp of the 5′ flanking region. Taken together, these results suggest that the eNos gene is regulated in the cardiac endothelium by both a PDGF-dependent and PDGF-independent microvascular bed–specific signaling pathway. Whole mount microphotographs of the 1600eNOSLacZ. 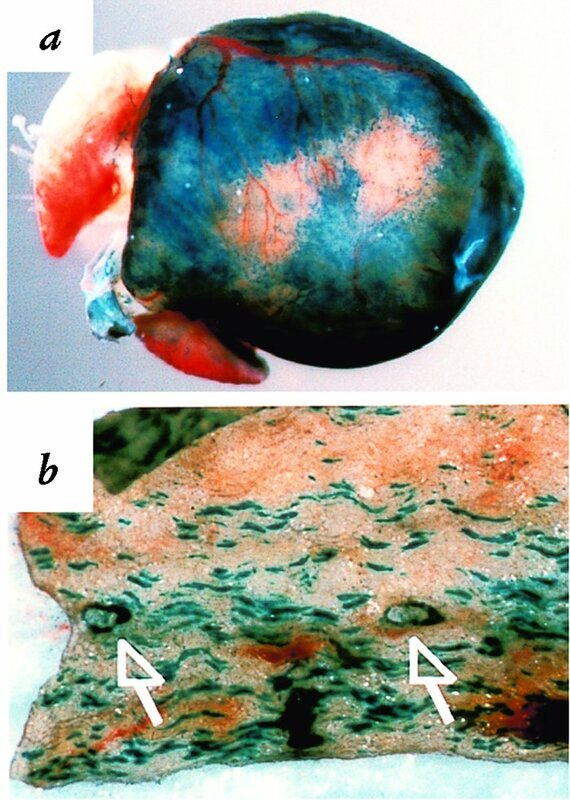 Incubation of the organs with the X-Gal substrate reveals LacZ staining in the adult heart (a) and aorta (b). LacZ staining in the heart represents β-galactosidase activity within microvascular and macrovascular endothelial cells (see Fig. 2). The X-Gal reaction product in the aorta is accentuated in endothelial cells surrounding the ostia of two intercostal tributaries (b, arrows). eNOS, endothelial nitric oxide synthase.